August 29th, 2007 : Partly sunny and warm, Water Temp 84* and Clear. Picked client up at 5 am this morning and went and caught about 150 Herring and a few Gizzards. Set up on a 25' flat and pulled it with 8 planner boards, 8 downlines and a bobber, rigged with assorted baits. We worked a stretch for an hour and a half, seeing fish but only getting a few hits. I was talking to John on the radio and he was seeing the same thing as I was , just single fish and nothing looking like it wanted to feed. Since the fish on Monday did not feed till 9 I decided to go catch some more bait so we did and loaded up the tank. I looked on some deeper flats and found a school and set out the same spread as we had out before. The fish were in the right formation to feed and I knew it wouldn't be long before they did so we hung in there and after 10 minutes the lake turned on. We had numerous hook ups and I called John over to join in . The screen was lit up and fish were actually breaking all around us. John came over and we all were hooked up at once and the action lasted for at least an hour.I decided to move , we had 35 baits left and I wanted to see if I could find another school in the same pattern and drove a mile and a half and found a larger school. We put downlines on them and they got hit as soon as we engaged the reel. I put the largest bait I had in the tank on and it lasted about 20 seconds before it hooked up. Bruce fought it for 20 seconds, pulling drag all the while. The fish got off, as some of the Hogs do , but we knew we were in some quality fish. We fished this school till we ran out of bait. 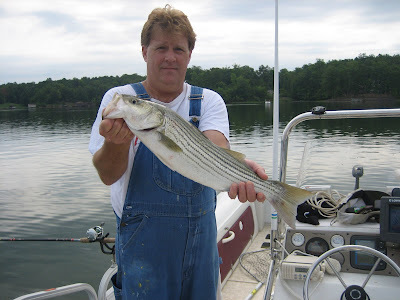 Bruce is pictured with the first Striper of the day, releasing all the fish he caught. Today we had well over 100 strikes and I lost count how many Stripers we actually caught. John and his crew had a good day trolling , keeping a few for the freezer and releasing the rest.